It's not her debt. But she's paying the price. CULVER CITY, CALIF. (January 23, 2013) – FOX's medical drama The Mob Doctor – based on Ron Felber's novel "Il Dottore: The Double Life of a Mafia Doctor" – will arrive on DVD March 12th when Sony Pictures Home Entertainment releases The Mob Doctor: The Complete Series is not rated. . The series introduces Dr. Grace Devlin, played by Jordana Spiro (TV's "My Boys"), as a young surgeon torn between morality and an unpaid family debt to a Southside mob boss played by William Forsythe (TV's "Boardwalk Empire"). Rounding out the ensemble cast are Zach Gilford (TV's "Friday Night Lights"), James Carpinello (The Punisher) and Željko Ivanek (TV's "Damages"). Series' guest stars include Michael Rapaport (Cop Land), Michael Madsen (Donnie Brasco), Shohreh Aghdashloo (The Odd Life of Timothy Green), Terry Kinney (Promised Land), Kevin Corrigan (The Departed) and Jennifer Beals (Flashdance). The Mob Doctor: The Complete Series is not rated. contains all 13 episodes in a three-disc DVD set. Produced by Sony Pictures Television the series was created by Josh Berman and Rob Wright (both TV's "Drop Dead Diva"). Berman, Wright, Michael Dinner (TV's "Justified") and Carla Kettner (TV's "Bones") serve as executive producers. Dr. Grace Devlin (Jordana Spiro, TV's "My Boys") is a promising young surgeon working in Chicago's most preeminent hospital. Still, she can't escape her Southside roots. With her kid brother facing a mobster's wrath, Grace makes a deal and agrees to work "off book" for the infamous Chicago Outfit. As Grace's "day job" forces her to take on emotionally compelling cases – a convict determined to donate his heart to his estranged daughter, a whole family injured in a horrific hit-and-run – she is also forced to deal with mob-related tasks, doing emergency medical procedures in back rooms, treating mobsters hiding from the law, and even working on a stolen thoroughbred only hours before he's due to race. Through it all, Grace fights to keep her dual life a secret… except from the one man who knows Grace best -- Southside mob boss Constantine Alexander (William Forsythe, TV's "Boardwalk Empire"), whose relationship with Grace is more than it seems. 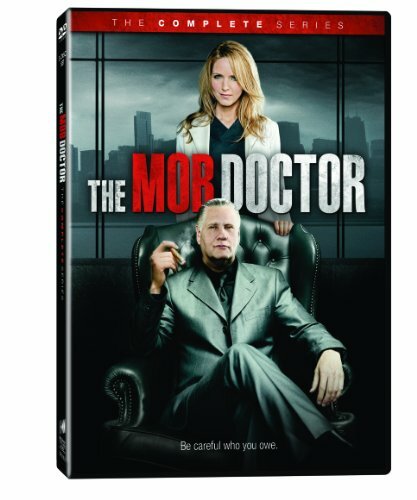 The Mob Doctor: The Complete Series is not rated.